Ruby Duke, seated, surrounded by her family. (L-R) Kelly Duke’s son/Ruby’s grandson Kasey Duke, Ruby’s son-in-law Jim Kerwin and daughter Gayle Kerwin, Ruby’s son Kelly Duke and daughter-in-law Kathy Duke. Ruby Duke, born Aug. 12, 1916 in Shattuck, Oklahoma , was the guest speaker at the General Federation of Women’s Clubs Heeko Chapter meeting on April 11. Ruby Duke has been a very active volunteer in Pawhuska since she and her late husband purchased a ranch and moved to the area in 1952. However, her speech to the Heeko ladies focused on her experiences as a newlywed rancher’s wife during the Great Depression and the Oklahoma Dust Bowl. Seated at the front of the room with over 40 guests and members of Duke’s family, she recounted stories of her life. Ruby said that the lessons she had learned during this period had stayed with her. Ruby described her life: “In 1935 everyone was poor. We were poor but we didn’t know it. We were happy. “Life was much more simple. Even though you were poor, you shared with those who had less than you … The Santa Fe Railroad ran through our town. We fed many homeless men who were riding the rails looking for work. They were daddies riding from town-to-town looking for work,” Ruby said. “Mom baked homemade bread twice a week. We shared what we had. My mom said, ‘We can’t afford to give both jelly and butter – you get one or the other.’ If we had milk, they got that too. “They rode under the box cars. It was dangerous,” she added. “When the class of ’35 graduated, we were too poor to get a class picture. No class rings – our families were too poor to buy them, but no one whined,” Ruby explained. At this time, the dust had already begun to blow,” Ruby said. On Saturdays, Ruby also cleaned house for her boss and his wife, Gladys. “Gladys always had smothered steak. We didn’t have that much steak at our house,” she said with a chuckle. As time went on, Gladys reduced Ruby’s cleaning duties a bit because the daily dust made her efforts moot and Gladys said no one would notice. Soon, a young man came on the scene. “There was a misplaced Texas cowboy in Oklahoma who bought a ranch northwest of Shattuck — Kay Duke. We started dating. He had a car, could take me to the movies, buy me a steak dinner once in a while and he loved to dance,” she said. They spent many an evening together at local dance spots. “He had no plan of getting married, and I didn’t either, but we sort of grew on one another.” The next thing she knew, she married Kay Duke and moved out to the ranch. “There was no electricity, no running water, no piped-in gas. You had to be young, dumb and happy and in love, but I was happy – extremely happy,” she said smiling as she thought of those days. “As a pioneer ranch woman, we had some funny happenings,” Ruby said. “Ranching is hard work. You hit the floor at five o’clock and you’re set for the day – all day. “My first wash day, I looked like I could bite a tin-penny nail in two and I felt the same,” she said. “There was a stick that moved the dash to make the wash go. Then you had a boiler – and you boiled your whites a while,” Ruby explained with a look of exasperation. When the Oklahoma Dust Bowl began in earnest, everything changed. They went into a survival mode. Ruby took the down the curtains and bed spreads. She just put sheets on their bed because the dust made it impossible to keep them clean. She covered the furniture with sheets to protect it. Fortunately, this was before the couple had their four children. Each night the dust blew. The next morning there was a dirty film over everything it reached. “This was like powder. You couldn’t wipe it off. You had to wash it off. That didn’t start you for a happy day,” Ruby said. Before she could make breakfast, the kitchen floors and cabinets had to be scrubbed with soap and water daily, she explained. Her husband, wearing a bandana around his nose to block the dust, would head to the barn to tend the livestock. “Before he got to the barn, he would just be a shadowy figure,” Ruby explained. She described Black Sunday, April 14, 1935, when black blizzards of dust rolled across Oklahoma. “We were at home and Kay went out on the porch and he called to me. All you could see was rolling thumping coming toward you. We went back into the house. It was so black, you couldn’t see your hand in front of you. We stood in the living room with our arms around each other. I was crying and Kay was trembling. It rolled over us and went on. Gradually, the light returned. “This in turn caused me to do some serious thinking. We decided to tour all of Oklahoma. We stopped in many places and talked to real estate people,” Ruby Duke said. “When we came to Pawhuska, there were red vinyl curtains blowing out of a window on Kihekah. My husband said, ‘Should we stop here?’ Nope, I said, let’s go on,” Ruby Duke said. They went on to visit Ponca City that day, but nonetheless ended up purchasing a ranch near Pawhuska soon thereafter. She and Kay had four children – three sons and a daughter. The youngest son, Ricky, was born after the move to Pawhuska. Kay Duke died in December 1975 and their son, Ricky, graduated from Pawhuska High School the following year. At the time, they were living at 403 E. 7th Street in Pawhuska. “When Ricky left to go to college I didn’t cry and didn’t show much emotion until after he drove away. For the first time in my life, I realized I was all alone. I went back to the house and threw a ring-tail fit. If you’d seen me, you’d have thought I was crazy – and maybe I was,” she said. However, soon thereafter, she threw herself into GFWC – Heeko and volunteerism. “I became involved,” Ruby said. As a GFWC – Heeko Club member, Ruby chaired or participated in many projects. Here are a few highlights as described by Eileen Monger, who introduced Ruby at the meeting. Ruby spearheaded efforts to clean up Pawhuska, meeting with the city manager seven times in 2003 to discuss the need to clean up the town. As a result, a code enforcement officer was hired to put teeth in the project. Ruby also wrote to absentee property owners in Pawhuska’s historic district and organized a committee to decorate empty businesses on Kihekah Avenue. She was instrumental in the renovation of the Blacksmith House, which now serves as the offices for the Chamber of Commerce. She chaired a two-year community improvement committee, enlisting the help of the city manager, chamber of commerce and the newspaper. “We worked together,” she said. Ruby was given the “Outstanding Volunteer Award” in 2002 for her many efforts. 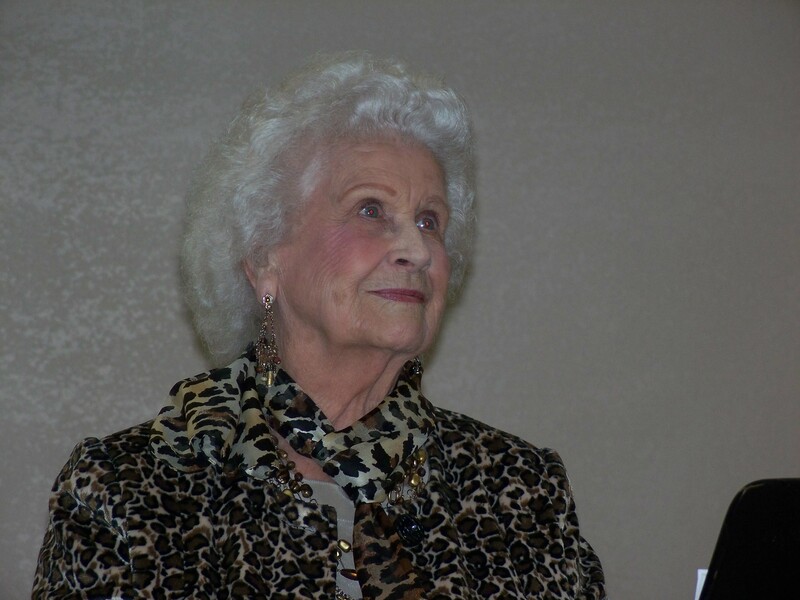 In addition, she has served in several capacities for the GFWC – Heeko Club, including as its president in 1957-58. As a leader in GFWC – Heeko, Ruby was always full of fun. She organized, what became the first of many, “style shows” for the club and has participated in many skits. At the conclusion of the meeting, Heeko member and Oklahoma GFWC President Joyce Ward thanked Ruby for her contributions over the years and gave her a gift of the first newly-released Oklahoma GFWC lapel pin. These days Ruby, who will be 95 on Aug. 12, is still going strong. She lives in Norman, Okla., and spends time with her family. 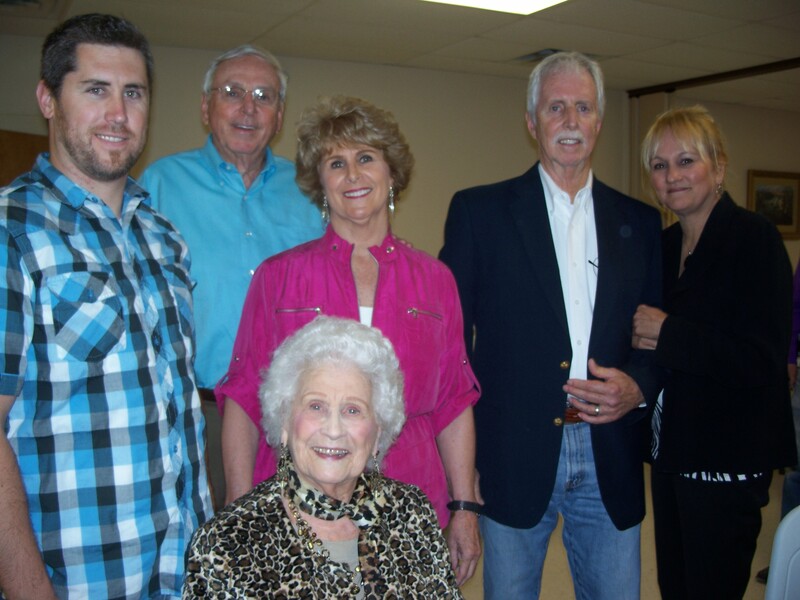 Several family members accompanied her to the meeting including: son Kelly and his wife Kathy Duke of Bixby, Kelly’s son/Ruby’s grandson Kasey Duke – a youth minister in Gore, Okla., and daughter Gayle Kerwin and her husband Jim Kerwin of Norman.